In assessing soil contamination, North Wind brings unparalleled expertise to projects. The company owns both ultraviolet optical screening tool (UVOST) and x-ray fluorescence (XRF) systems for soil screening. UVOST’s laser-induced fluorescence (LIF) technique, in conjunction with direct push deployment, yields a detailed 3D map of the nonaqueous phase liquid (NAPL) distribution, in real time – offering a true “seek and find” adaptive site characterization capability, as promoted by EPA’s TRIAD approach. 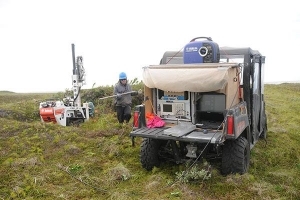 In 2012, the company completed one of the largest UVOST screening projects ever conducted to date in Alaska. On this project, North Wind drill rigs completed more than 1,450 UVOST soil borings – which equates to almost 4 miles drilled! North Wind also utilizes an AMS Power Probe 9630 VTR-M, one of the most versatile direct push rigs available today. Our VTR-M is mounted on a Bobcat Mini Track Loader, making it easily transported by either trailer or aircraft to remote locations. The rig is only 3 feet wide, making almost any location accessible, and the rugged rubber tracks of the VTR-M Power Probe keep this rig moving when soil conditions get soft, wet, or muddy with minimal disturbance to the work site. In addition, our VTR-M has the one of the most powerful hammers on the market, with 22,000 pounds of pull-down force and 27,000 pounds of pull-up force – more than enough power to complete most direct-push projects. North Wind excels at project delivery in extremely remote locations, including areas accessible only by barge, helicopter or plane and with no local services.